So turns out, I have a lot (and I mean A LOT) of lip products. I didn’t realise this until I emptied my bag the other day and found a mixture of approximately 10 lip products from light moisturising balms to full blown colour packing glosses… And that was simply the beginning. I will probably blog about my lip product collection soon actually as the amount is particularly ridiculous, but I have found some hella good storage for them, which ISN’T muji or acrylic… I know right? Breaking all the rules. Anyway, I did find myself reaching for the same 3 products these past few weeks and these are what they be! A lot have been doing the rounds on blogs anyway, like the EOS lip balm, but my latest discovery is the most unique and lovely lip product yet… Yeah you read on to find out more….You little tinker you. So yes, let’s begin with the beauty bloggers fave; EOS Lipbalm. This was doing the rounds about 6 months ago and I am endlessly late to that party, what can I say? My invitation to the smooth lip soiree got lost in the post. I got this EOS Sweet Mint Lip Balm from Big Green Smile, which is a lovely little haven for all things natural for beauty in the UK. It’s great to see such a good range of natural products for sale all in one place actually! At £4.99 a pop I wouldn’t say this was the cheapest lip balm on the market, but it’s certainly the nicest mint one I have tried I tell thee! 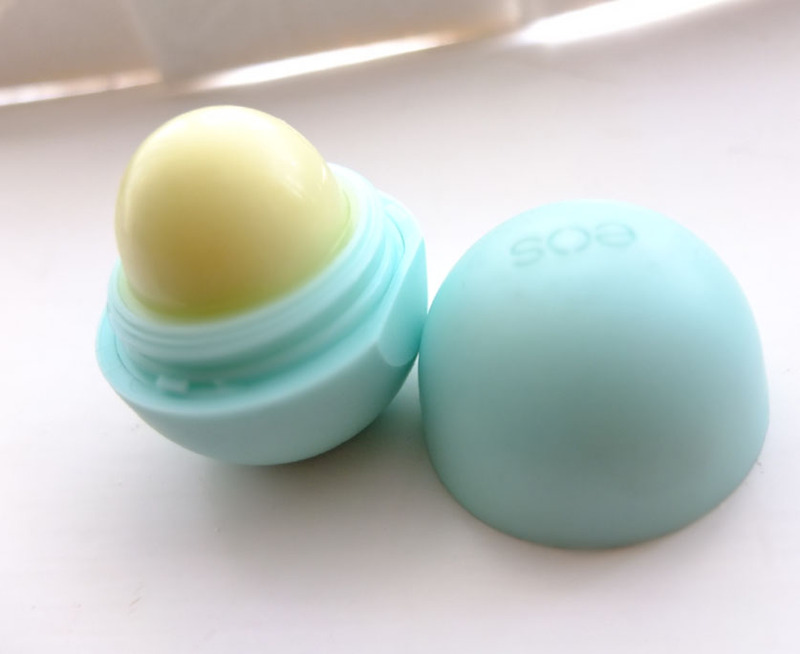 It’s a weird little ball shape with a twist off lid, that reveals a weird nubbin of lip balm. I must say I don’t really *get* why this design is so raved about as I do feel a little strange rubbing an egg of lip balm around my chops, but the balm itself is lovely. It’s almost a refreshing sensation – a bit like Carmex in a tingly way and delivers a nice punch of hydration that does last. My main criticism though is the type of plastic they’ve used for the eggy weggy packaging. It’s that weird matte yet soft finish that seems to pick up dirt very easily and looks a bit grubby when it’s been in your hand bag for a month or so, but that doesn’t detract from what’s inside – and that’s what counts right? I’m still dying to try the melon flavour of this, so might make another sneaky purchase. Second to be praised today is the Oriflame Triple Core lipstick. You’ve seen me rave about Oriflame over and over, and this is me singing their praises from the rooftops once again. You know how much I heart the Oriflame Power Shine Satin Core lipsticks and this takes the concept of that one step further by also having a layer of balm inside the core of the lipstick alongside a layer of delicate shimmer encapsulated in the lipstick itself. 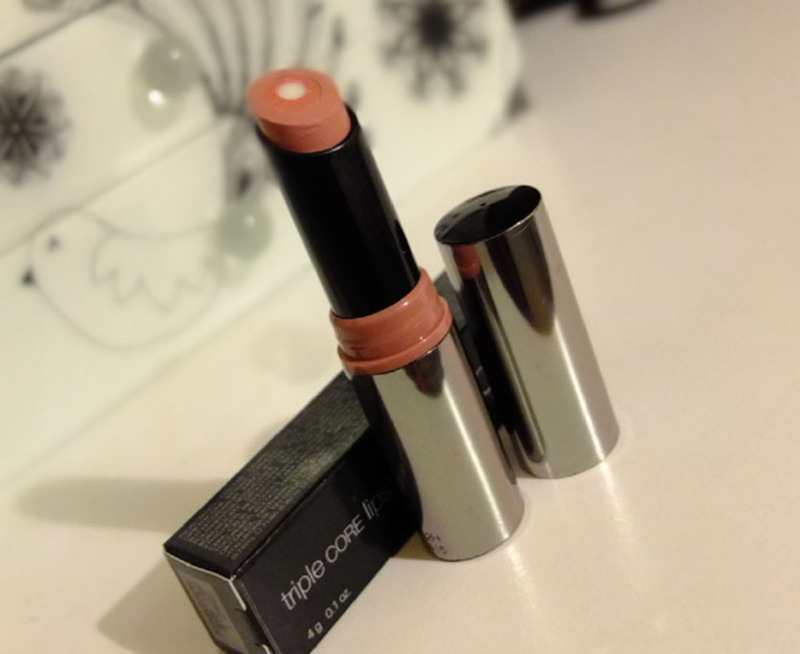 The triple core lipstick is much more sheer than the satin core version, but that may be due to the colour I have. I might purchase some of the stronger shades to see what the colour pay off is like, but this one is a wonderful neutral shade which is perfect for day time, especially when you do your make up in the morning before work and want a hint of colour with added moisture for the day ahead. It lasts a while too before you need to reapply. And Brucey Bonus time – I just noticed the ”Trend Edition” is pretty much half price but in even more prettier colours, so you can try it for £5.95 instead of £10.95 if you fancy a bit more of a snazzy packaging. And last (but not least, obviously) the Korres Lip Butter in Pomegranate. Yes, I’ve branched out from the Wild Rose one and tried another shade! Go team! This one is much creamier than the original Wild Rose one I loved so much, and is a nice little off coral/peach shade. Moisture wise, this does deliver the same lovely amount of softness as the Wild Rose lip butter, but the colour is much less glossy which also doesn’t colour your lips quite as well. It’s definitely going to be used a lot more during summer months (if we ever get them?!?!) as it’s a lot lighter in colour and makes me think of springggggg. The only problem with these lip butters is that they can boarder a bit on the messy side when you’re out and about without a tissue to hand and if they were in a stick form I don’t think they’d be as good! I think that’s why the Pomegranate version has taken over as a favourite at the moment as it’s that tiny bit less of a mess with it being a lighter shade. Have you got any current favourites you’d like to share? Or do you unintentionally hoard thousands of lip products too? I wonder if there’s any I haven’t discovered yet…..
Next Post Gousto Recipe Box.